When CZ was accepted to the Wolseley Farmers’ Market, I realized that a 10 x 10 space is more than enough for what we’ve got. So, it was decided that each month at our booth we’d make a craft for a local organization and collect donations. 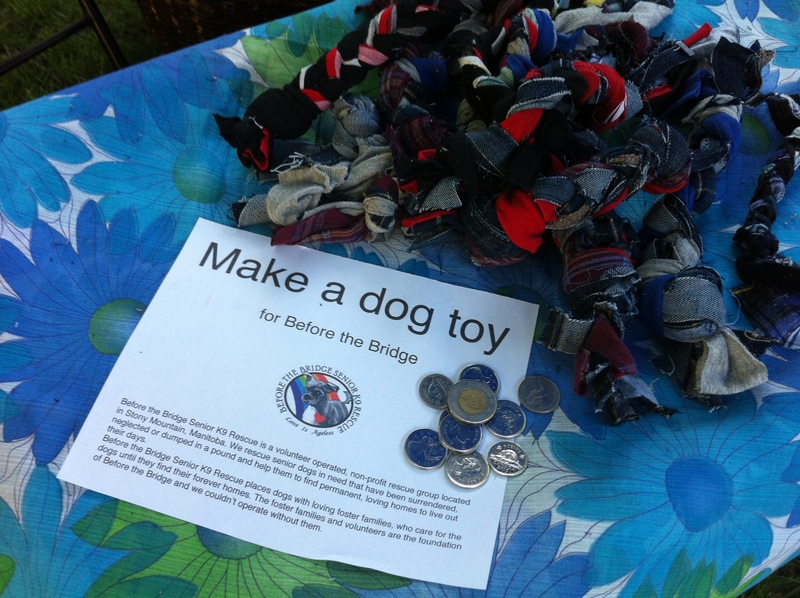 This month we chose to make dog toys for Before the Bridge, a senior dog rescue. I’ve personally met the woman who runs the rescue and even been in her home. I’ve seen how she treats the dogs and how much she cares about their wellbeing. If you’re looking for a rescue to support, keep Before the Bridge in mind. Next week we’ll be making cat toys for Craig Street Cats, but you can make your own dog toys on your own. Got an idea for who we can craft for in August? We’d love some suggestions!